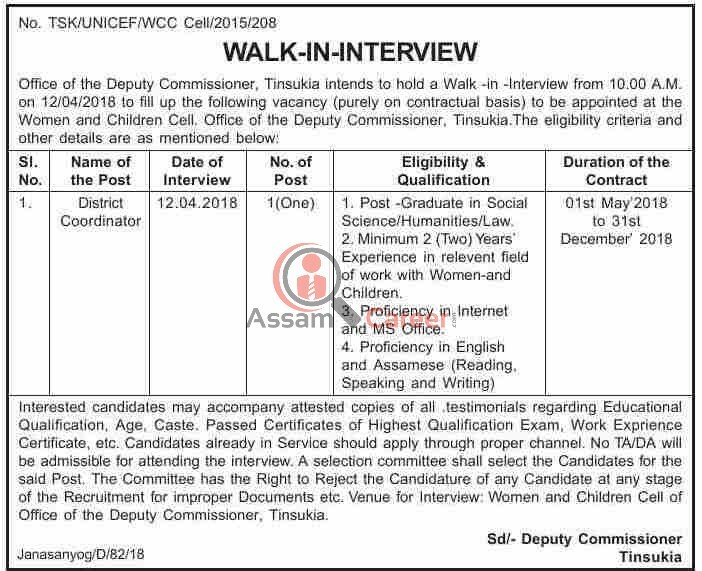 Office of the Deputy Commissioner, Tinsukia intends to hold a Walk -in -Interview from 10.00 A.M. on 12/04/2018 to fill up the following vacancy (purely on contractual basis) to be appointed at the Women and Children Cell. Office of the Deputy Commissioner, Tinsukia. 1. Post -Graduate in Social Science/Humanities/Law. 2. Minimum 2 (Two) Years’ Experience in relevent field of work with Women-and Children. 3. Proficiency in Internet and MS Office. Venue for Interview: Women and Children Cell of Office of the Deputy Commissioner, Tinsukia. How to apply: Interested candidates may accompany attested copies of all .testimonials regarding Educational Qualification, Age, Caste. Passed Certificates of Highest Qualification Exam, Work Exprience Certificate, etc. Candidates already in Service should apply through proper channel. No TA/DA will be admissible for attending the interview. A selection committee shall select the Candidates for the said Post. The Committee has the Right to Reject the Candidature of any Candidate at any stage of the Recruitment for improper Documents etc.